The UNT women’s volleyball club is looking forward to their spring season after a promising start at the TCU tournament on Jan. 26. The club’s A team was ranked No. 6 out of the 20 teams competing while the B team was ranked No. 18. 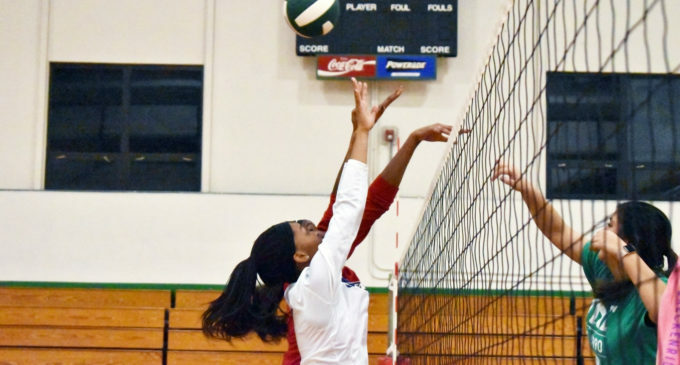 The UNT women’s volleyball club competes in both the Southern Intercollegiate Volleyball Association (SIVA) and the National Collegiate Volleyball Federation (NCVF). While both of the associations are collegiate, they are still for club sports. Other schools such as Texas A&M, Texas and Texas State also compete in these conferences. The team competes in SIVA during their spring season and also participate in the NCVF nationals tournament that is hosted out of state. A-team coach and UNT alumni Chaz Rasmussen said the UNT team is different from the NCAA. The NCVF nationals tournaments are broken up by A and B teams, the A teams play other A teams and B teams play other B teams. The SIVA conference is smaller than NCVF, because of this, the teams are broken up into northern and southern divisions. The UNT women’s volleyball club is part of the northern division of SIVA. Looking into the season, UNT alum and B-team coach Keirsten Gomez said she is excited to see the girls improve the game they love. “Being able to see [the team] grow, work hard and seeing that pay off at nationals and being able to be a part of that is something I’m looking forward to the most this season,” Gomez said. The biggest challenge the team faces this season is being able to find students willing to commit the extra time it takes to be a full-time team member. Senior club president Sydnie Walker said that despite the low number of players, the team still give it their all. Freshman B-team player, Kaylla Thomas, takes a hit from the outside. Image by: Bayleigh Swanton. The club hosts tryouts for both the fall and spring semesters. The teams usually rotate out when people quit and new people join. While this does not hold the club back, it does pose a few challenges when having to work with new people after playing with the same teammates for a whole semester. The UNT volleyball club is one of the few club sports on campus that have a volunteer coach. Club sports are funded through the recreation center, which is funded by students, the clubs funds are not to be used to pay coaches. Both Rasmussen and Gomez are former players of the club teams and have taken to spend with the team and help them improve anyway possible. The club is serious about the competition, the fun and family environment surrounding the sport and club is something that keeps the players invested and keeps them motivates him. Featured Image: Junior B-team player Stefanie Mitchell and freshman Kaylla Thomas jump to block the ball from the middle. Image by: Bayleigh Swanton.